There are numerous blog posts and discussions about how the GISS global temperature anomaly product GISTEMP differs from the Hadley Centre and NCDC datasets. The repeated reasons presented for this are, GISS uses 1200km radius smoothing to fill in the areas of the globe with sparse surface temperature readings, and the area this has the greatest impact is the Arctic. Typically, a map or comparison of global temperature anomaly maps is included, similar to Figure 1. The top two maps were cropped from Figure 3 in the Real Climate post “2009 temperatures by Jim Hansen”. I added the third. The bottom map was created at the GISS Global Maps webpage. It’s a map of the GISTEMP Global Temperature Anomaly product with 250km radius smoothing for the calendar year 2005, the same year as the top two maps. I did not include a temperature scale because the bottom map was provided to allow a visual comparison of the spatial coverage of the HadCRUT product and the GISTEMP product with 250km radius smoothing. Examine the Arctic and the ocean surrounding Antarctica, the Southern Ocean. Notice a difference? In 2005, the HadCRUT data had better coverage of the Arctic and Southern Oceans than the GISTEMP dataset with 250km radius smoothing. What’s missing in the GISTEMP product? There’s no sea surface temperature data. The general regions where GISS deletes Sea Surface Temperature data are shown in Figure 2. Three areas are highlighted: two cover the Arctic Ocean, and a third surrounds Antarctica. The specific locations are clarified in the following. GISS then uses their 1200km radius smoothing to replace the sea surface data with land data. This means that vast regions of Sea Surface Temperature (SST) anomaly data in the Arctic Ocean and Southern Ocean are deleted from the GISTEMP record. GISS does not delete all of the Arctic and Southern Ocean SST anomaly data, just the data from the areas where the annual sea ice melt occurs, and those are good portions of them. I have looked for but have not found an explanation for this exclusion of Sea Surface Temperature data in the papers provided on the GISTEMP references page. Figure 3 shows four Arctic (North Pole Stereographic, 65N-90N) maps prepared using the map-making feature of the KNMI Climate Explorer. The maps illustrate temperature anomalies and sea ice cover for the month of September, 2005. The calendar year 2005 was chosen because it was used in the RealClimate post by Jim Hansen, and September is shown because the minimum Arctic sea ice coverage occurs then. The contour levels on the temperature maps were established to reveal the Sea Surface Temperature anomalies. Cell (a) shows the Sea Ice Cover using the Reynolds (OI.v2) Sea Ice Concentration data. The data for the Sea Ice Cover map has been scaled so that zero sea ice is represented by grey. In the other cells, areas with no data are represented by white. Cell (b) illustrates the SST anomalies presented by the Reynolds (OI.v2) Sea Surface Temperature anomaly data. GISS has used the Reynolds (OI.v2) SST data since December 1981. It’s easy to see that SST anomaly data covers the vast majority of Arctic Ocean basin, wherever the drop in sea ice permits. Most of the data in these areas, however, are excluded by GISS in its GISTEMP product. This can be seen in Cell (c), which shows the GISTEMP surface temperature anomalies with 250km radius smoothing. The only SST anomaly data used by GISS exists north of the North Atlantic and north of Scandinavia. The rest of the SST data has been deleted. The colored cells that appear over oceans (for example, north of Siberia and west of northwestern Greenland) in Cell (c) are land surface data extending over the Arctic Ocean by the GISS 250km radius smoothing. And provided as a reference, Cell (d) presents the GISTEMP “combined” land plus sea surface temperature anomalies with 1200km radius smoothing, which is the standard global temperature anomaly product from GISS. Much of the Arctic Ocean in Cell (d) is colored red, indicating temperature anomalies greater than 1 deg C, while Cell (b) show considerably less area with elevated Sea Surface Temperature anomalies. Basically, GISS excludes Arctic Ocean SST data from 65N to 90N and, for round numbers, from 40E to 40W. This is a good portion of the Arctic Ocean. Of course, the impact would be seasonal and would depend on the seasonal drop in sea ice extent or cover. The sea ice extent or cover has to decrease annually in order for sea surface temperature to be measured. I’ll use the above-listed coordinates for the examples that follow, but keep in mind that they do not include areas of sea ice in the Northern Hemisphere south of 65N where sea surface temperature data are also deleted by GISS. These additional areas are highlighted in Figure 4. They include the Bering Sea, Hudson Bay, Baffin Bay and the Davis Strait between Greenland and Canada, and the Sea of Okhotsk to the southwest of the Kamchatka Peninsula. Note: GISS uses Hadley Centre HADISST data as its source of Sea Surface Temperature (SST) data from January 1880 to November 1981 and NCDC Reynolds (OI.v2) data from December 1981 to present. To eliminate the need to switch between or merge SST datasets, this post only examines the period from 1982 to present. And to assure the graphics presented in Figures 3 and 6 are not biased by differences in base years of the GISTEMP data and the Reynolds (OI.v2) SST data, the latter of which has only been available since November 1981, I’ve used the period of 1982 to 2009 as base years for all anomaly data. WHY WOULD DELETING SEA SURFACE TEMPEATURE DATA AND REPLACING IT WITH LAND SURFACE DATA BE IMPORTANT? Land Surface Temperature variations are much greater than Sea Surface Temperature variations. Refer to Figure 5. Since January 1982, the trend in GISTEMP Arctic Land Surface Temperature Anomalies (65N-90N, 40E-40W) with 250km radius smoothing is approximately 8 times higher than the Sea Surface Temperature anomaly trend for the same area. The Arctic Ocean SST anomaly linear trend is 0.082 deg C/ decade, while the linear trend for the land surface temperature anomalies is 0.68 deg C/decade. And as a reference, the “combined” GISTEMP Arctic temperature anomaly trend for that area is 9 times the SST anomaly trend. By deleting the Sea Surface Temperature anomaly data, GISS relies on the dataset with the greater month-to-month variation and the much higher temperature anomaly trend for its depictions of Arctic temperature anomalies. This obviously biases the Arctic “combined” temperature anomalies in this area. Figure 6 shows four maps of Antarctica and the Southern Ocean (South Pole Stereographic, 90S-60S). It is similar to Figure 8. Cell (b) illustrates the SST anomalies presented by the Reynolds (OI.v2) Sea Surface Temperature anomaly data. SST anomaly data covers most of the Southern Ocean, but GISS deletes a substantial portion of it, as shown in Cell (c). The only SST anomaly data exists toward some northern portions of the Southern Ocean. These are areas not “covered occasionally by sea ice”. -Combined Land and Sea Surface of the GISTEMP product with 1200km radius smoothing, the GISTEMP standard product. The variability of the Antarctic land surface temperature anomaly data is much greater than the Southern Ocean sea surface temperature data. The linear trend of the sea surface temperature anomalies are negative while the land surface temperature data has a significant positive trend, so deleting the major portions of the Southern Ocean sea surface temperature data as shown in Cell (c) of Figure 6 and replacing it with land surface temperature data raises temperature anomalies for the region during periods of sea ice melt. Note that the combined GISTEMP product has a lower trend than the land only data. Part of this decrease in trend results because the latitude band used in this comparison still includes portions of sea surface temperature data that is not excluded by GISS (because it doesn’t change to sea ice in those areas). When you create a map at the GISS Global Maps webpage, two graphics appear. The top one is the map, examples of which are illustrated in Figure 1, and the bottom is a Zonal Mean graph. The Zonal Mean graph presents the average temperature anomalies for latitudes, starting near the South Pole at 89S and ending near the North Pole at 89N. Figure 8 is a sample. It illustrates the changes (rises and falls) in Zonal Mean temperature anomalies from 1982 to 2009 of the GISTEMP combined land and sea surface temperature product with 1200km radius smoothing. The greatest change in the zonal mean temperature anomalies occurs at the North Pole, the Arctic. This is caused by a phenomenon called Polar Amplification. To produce a graph similar to the GISS plot of the changes in Zonal Mean Temperature Anomalies, I determined the linear trends of the GISTEMP combined product (1200km radius smoothing) in 5 degree latitude increments from 90S-90N, for the years 1982 to 2009, then multiplied the decadal trends by 2.8 decades. I repeated the process for HADCRUT data. Refer to Figure 9. The two datasets are similar between the latitudes of 50S-50N, but then diverge toward the poles. As noted numerous times in this post, GISS deletes sea surface temperature data at higher latitudes (poleward of approximately 50S and 50N), and replaces it with land surface data. Figure 10 shows the differences between the changes in GISTEMP and HADCRUT Zonal Mean Temperature Anomalies. This better illustrates the divergence at latitudes where GISS deletes Sea Surface Temperature data and replaces it with land surface temperature anomaly data, that latter of which naturally has higher linear trends during this period. There appears to be some confusion in the comments in the WattsUpWithThat thread of my post GISS Deletes Arctic And Southern Ocean Sea Surface Temperature Data about what this post illustrates. I prepared a graph for this post but chose not to use it since it appeared redundant to me. It should clarify what is being presented. It is a comparison graph of GISTEMP Arctic Surface Temperature anomalies for the grid 65N-90N, 40E-40W, which is a major portion of Arctic Ocean as shown above in Figure 4. One dataset is the combined land plus sea surface data; the other is the land-only data. The two datasets are identical. If you subtract one from the other, the difference is 0.0 (zero) for all months. This indicates that there is no Sea Surface Temperature data in the combined product in this grid. Does the Sea Surface Temperature data exist for this area? Yes. It is illustrated above as the green curve in Figure 5. To me, this indicates that GISS deleted the sea surface temperature data for this portion of the Arctic. A number of bloggers on the WattsUpWithThat thread “Tom Karl’s Senate Dog & Pony Show – it’s worse than we thought, again” noted the curious errors in the trend lines in Tom Karl’s presentation to Senate. The one that stood out for me was slide 21, presented here as Figure 1. 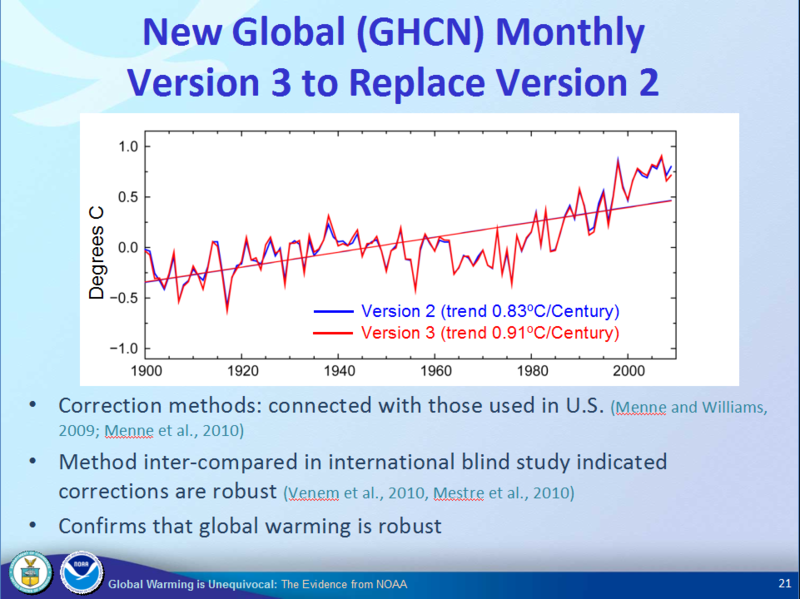 It showed the global land surface temperature anomalies and linear trends for the new (Version 3) versus existing (Version 2) Global Historical Climatology Network (GHCN) dataset. First Observation: The slide title states the data is monthly, but the data illustrated are annual averages. Figure 2 is a graph of monthly Global Land Surface Temperature anomalies presented by the NCDC from January 1900 to April 2010. Monthly global land surface temperature anomaly data should look like that, with lots of month-to-month variation. Second, there are two linear trends listed on the Karl slide. Version 2 is noted to have a linear trend of 0.83 deg C/Century, while Version 3 is claimed to have a linear trend of 0.91 deg C/Century. But the trend lines are nearly identical and they present linear trends of approximately 0.75 deg C/Century, Figure 3. The trend lines are erroneous or the values listed for the trends are wrong. Trend lines of 0.83 and 0.91 deg C/Century should be noticeably different, as shown in Figure 4. And for reference, the NCDC’s Monthly Global Land Surface Temperature anomaly data, Figure 5, has a linear trend of 0.78 deg C/Century. And the the NCDC’s Annual Global Land Surface Temperature anomaly data, Figure 6, has a linear trend of 0.77 deg C/Century. I just took a quick look at NINO3.4 SST Anomalies, and for the week centered on Wednesday May 12th, they’ve dropped into negative numbers: -0.075 deg C.
The map of Global OI.v2 SST anomalies for April 2010 downloaded from the NOMADS website is shown below. The drop in central equatorial Pacific SST anomalies toward ENSO-neutral temperatures is obvious. The response should work its way eastward over the next couple of months. NINO3.4 SST anomalies are dropping but El Niño conditions remained during April in the central tropical Pacific (Monthly NINO3.4 SST Anomaly = +0.68 deg C). Weekly data has fallen into ENSO-neutral ranges (+0.30 deg C). Global SST anomalies increased slightly again during April (0.017 deg C). On a hemispheric basis, the rise was limited basically to the Northern Hemisphere, since the increase in the Southern Hemisphere was negligible (0.002 deg C). And looking at the major ocean basins, the North Pacific, South Atlantic, Indian Ocean, and the East Indian-West Pacific Ocean datasets all show drops this month, but they were not strong enough to outweigh the rises in the North Atlantic and South Pacific. The SST anomalies in the East Indian and West Pacific have ended (temporarily) their lagged rise in response to the El Niño . Will they also rise, noticeably, in response to a La Niña as they have in the past? Will there even be a La Niña following this El Niño? Refer to Typical (Average) El Nino, Traditional El Nino, and El Nino Modoki Events. I’ve added this dataset in an attempt to draw attention to the upward step response. Using the 1986/87/88 and 1997/98 El Niño events as references, East Indian-West Pacific SST Anomalies peak about 7 to 9 months after the peak of the NINO3.4 SST anomalies, so we shouldn’t expect any visible sign of a step change for almost 18 to 24 months. We’ll just have to watch and see. The MONTHLY graphs illustrate raw monthly OI.v2 SST anomaly data from November 1981 to April 2009. The weekly NINO3.4 SST anomaly data illustrate OI.v2 data centered on Wednesdays. The latest weekly NINO3.4 SST anomalies are +0.30 deg C. They’re working their way down. How low will they go? Just a quick post. The weekly OI.v2 NINO3.4 SST anomalies dropped out of El Niño range last week, the week centered on Wednesday April 28th. They are presently at ~0.47 deg C.
I’ll provide the monthly update for April on Monday when the monthly data is official. The Sea Surface Temperature (SST) anomalies for the South Atlantic are shown in Figure 1. First observation: it’s a noisy dataset. Then, other than the dip and rebound in 1991/92, likely caused by the eruption of Mount Pinatubo, and other than the mysterious dip and rebound that occurred in 1996/97, SST anomalies have been relatively flat there from the late 1980s to the late 1990s. Until 2009/2010. The normal dip after the seasonal spike did not occur early in 2009. SST anomalies rose instead. Figure 11 is a comparison of South Atlantic low latitude SST anomalies and the SST anomalies for the South Atlantic basin. Though there are periods of divergence, the variations of the low-latitude data correlate well with the basin data--the low latitudes exaggerating the basin data.